Baffin Bay (Inuktitut: Saknirutiak Imanga,) is a marginal sea of the North Atlantic Ocean. It is between Baffin Island and the southwest coast of Greenland. It connects to the Atlantic by Davis Strait and the Labrador Sea. A narrower Nares Strait connects Baffin Bay with the Arctic Ocean. People lived in the bay area from around 500 BC. First there were the Dorset and then Thule and Inuit people. It was reached by Europeans in 1585. William Baffin described the bay in detail in 1616. He is who the bay and the island are named after. People cannot travel on the bay most of the year because of the ice cover and large amount of floating ice and icebergs in the open areas. Baffin Bay was the epicenter of a 7.3 magnitude earthquake in 1933. This is the largest known earthquake north of the Arctic Circle. The North Water provides air to ice algae and zooplankton. There are many animals. Of about 20,000 Beluga whales living in the Baffin Bay, some 15,000 are around the North Water. Other animals of the region include walrus, narwhal, Harp Seal, bearded seal, ringed seal and polar bear. There are about 400 plant and tree species on the bay shores, including birch, willow, alder and plants adapted to salty soils, as well as lyme grass, mosses, and lichens. These serve as food for caribou and rodents, such as lemming. Resident fish species include polar cod, Arctic flounder (Pleuronectidae, Liopsetta), four-horned sculpin and capelin. The birds of the bay are the Little Auk, Snowy Owl, Willow Ptarmigan, Rock Ptarmigan, Gyrfalcon, Arctic Redpoll and guillemots. Most of them migrate to the south during the winter. ↑ E. C. Pielou (1994-11-01). A naturalist's guide to the Arctic. pp. 235, 292. ISBN 978-0-226-66814-7. ↑ Maurice L. Schwartz (2005). Encyclopedia of coastal science. p. 48. ISBN 1-4020-1903-3. 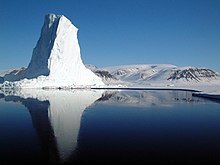 Wikimedia Commons has media related to Baffin Bay. This page was last changed on 29 January 2019, at 09:47.